This occurs when the weight sensors detect about 65 lbs (29 kg) or less, the weight of an infant or small child, on the seat. 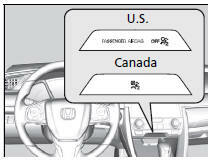 If the front passenger seat is empty, the passenger’s front airbag will not deploy and the indicator will come on. There is no child seat or other object pressing against the rear of the seat-back. There is no rear passenger pushing or pulling on the back of the front passenger’s seat. The front seat or seat-back is not forced back against an object on the seat or floor behind it. There is no object placed under or beside the front passenger’s seat. The occupant is not leaning against the door or center console. The occupant’s feet are placed on the floor in front of them. There are no objects hanging from the front passenger’s seat. Only small, lightweight objects are in the seat-back pocket. The passenger airbag off indicator may come on and go off repeatedly if the total weight on the seat is near the airbag cutoff threshold. All of the above conditions are met, and the indicator comes on with an adult seated in the front passenger seat. The seat is empty and the indicator is off. Do not allow an adult passenger to ride in the front seat when the indicator is on.